Chemically, coconut oil is a saturated fat. However, unlike most saturated fats, coconut oil is actually a healthy food and should have a place in every bodybuilder’s diet. It is extracted from the kernel of mature coconuts and because of its excellent heat stability, it makes an ideal cooking oil and is resistant to rancidity. Coconut oil is made up of medium chained fatty acids, mainly lauric acid, and hence does not rely on bile salts for digestion. It is easily digested and absorbed by the body, and quickly converted to energy. In 2003, a study conducted by C Beermann and colleagues found that this oil helps to burn other fats and increases your metabolic rate, thus aiding in lowering your body fat levels, according to lipidworld.com. Thus, coconut oil is used by bodybuilders pre-contest, when they want to reduce body fat but retain muscle mass. The bodybuilder’s post-workout drink or meal should contain the right nutrients to stimulate insulin secretion, as this is the hormone that will pump nutrients into the muscles. As reported in the "Journal of Surgical Research" by M Garfinkel and colleagues, coconut oil is highly insulinotropic, and hence a spoon of this oil makes a great addition to the bodybuilder’s post workout shake. Moreover, because it is easily digested, it does not slow down the absorption of other nutrients, as long-chained fatty acids would. Strenuous training takes a toll on the body’s immune function, and you are especially vulnerable right after a workout. The lauric acid in coconut oil has been found to have antiviral and antibacterial properties, hence another reason for including it in the post workout shake. Mike Konlee, in “Immune Restoration Handbook”, reports that this oil might be able to disable the herpes and Epstein-Barr viruses, and it combat candida infections. Recent research by G. Hurtado de Catalfo and colleagues indicates that coconut oil optimizes testosterone production by enhancing the activity of the enzymes involved in the synthesis of this hormone. 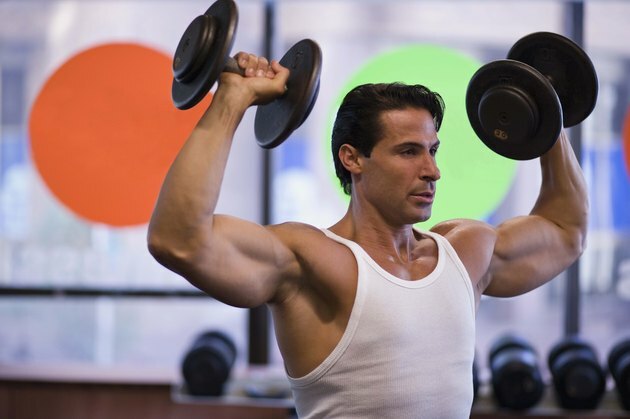 Testosterone is the key hormone responsible for muscle growth, and in men, it peaks in the early 20s and subsequently starts to go down with age. Thus, coconut oil might be especially useful for bodybuilders over 30 and others with suboptimal testosterone levels. As reported in the "International Journal of Sport Nutrition and Exercise Metabolism" by J. Goedecke and colleagues, coconut oil taken before training has the potential to enhance performance, as the body would use the medium chain fatty acids in addition to carbohydrates to power exercise. Thus, fatigue would be delayed as glycogen stores are spared and there is less build up of lactic acid. Lipids; Influence of commercial dietary oils on lipid composition and testosterone production in interstitial cells isolated from rat testis; G Hurtado de Catalfo, M de Alaniz, and C Marra.